When Apple gave the world its first glimpse of iOS 7 in June, professional designers and ordinary iPhone users alike were struck by the radical visual changes that the company had made to its signature mobile operating system. While Apple touted the brighter, flatter, and simpler design as the "biggest change to iOS since the introduction of the iPhone," members of the design community denounced the new interface as "ugly," "childish," and "inconsistent." iOS 7 is set to debut worldwide on Wednesday, and Apple has yet to address many of these aesthetic shortcomings. 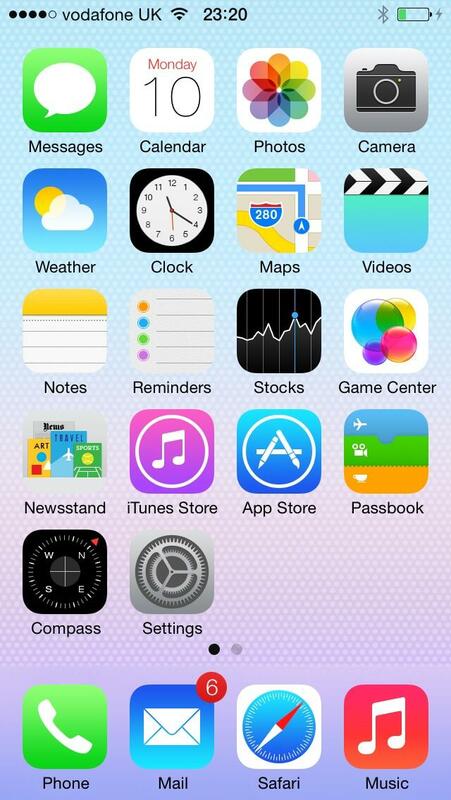 At the center of the criticism were iOS 7&apos;s new home screen application icons, whose lush, metaphorical designs were replaced by colorful, geometric abstractions. "Game Center is now a collection of 3D globs, rendered together against a white background, while the Camera icon recalls something more like clip-art," wrote Joshua Topolsky on The Verge shortly after Apple revealed iOS 7 at its World Wide Developer Conference this year. "It looks shockingly basic, and more childish than elegant." Yet despite these updates, the icons for default apps like Safari, Mail, and Settings (you know, the ones you use every day) still look like they were designed with a box of crayons in a third-grade art class. Ian Storm Taylor has already summarized the main issues with these icons from a design standpoint, focusing on their poor color choice and weak use of metaphor. These are all legitimate criticisms that Apple has yet to address. From my perspective, however, the main problem with the iOS 7 stock app icons is a lack of follow-through. In an attempt to move away from his company&apos;s hallmark philosophy of skeuomorphism (the merits of that decision are a different debate entirely), iOS 7 lead designer Jony Ive took a page out of Google&apos;s "reductive" design policy by running over all of the home screen icons with a steamroller. You can see the results of this process in this GIF, which also features a creepy facial transformation between Ives and his predecessor, Scott Forstall. As the icons morph from iOS 6 to iOS 7, they become flatter. Upon closer inspection, however, you&apos;ll notice that many retain a vertical color gradient — in other words, they&apos;re not totally flat. Take a look at the background of the mail icon, for example, which shifts from royal blue to a lighter blue as you look from top to bottom. Bear with me as I get a bit technical here: This blue gradient creates an illusion of concave depth that contradicts the flat appearance of the white envelope. This may seem like a trivial point, but it has a huge impact on the overall look of iOS 7. Additionally, you&apos;ll notice that many other stock icons, like Weather, iTunes, Music, and Messages, sport this type of light/dark color gradient. The new App Store icon uses an almost identical spectrum of blue as Mail. However, like the Phone and Camera icons, its gradient goes in the opposite direction, giving the background a convex appearance. Not only is Apple&apos;s use of gradients at odds with the "flat" theme; it&apos;s also inconsistent with itself. It turns out I&apos;m not the only one frustrated by iOS 7&apos;s abominable gradients. Shortly after the WWDC announcement, art director Andrew Burwell tweeted, "I&apos;d rather the icons have no gradient than look like they do." This sentiment was echoed by many designers, according to The Atlantic Wire. The problem with iOS 7 isn&apos;t that Apple decided to jump on the bandwagon of the flat design trend, led by Microsoft and Google. Rather, the issue is that Apple&apos;s designers couldn&apos;t bring themselves to leave behind their beloved gradients, producing instead an almost-but-not-quite-level texture that feels unsettling. "I still thought that Apple could have gone flatter," remarked one user on the MacRumors forums. The same user then posted a refined version of the iOS 7 home screen icons using Apple&apos;s own designs and color palate, but without the gradients. Image courtesy of MacRumors user cobbyco. The icons still retain a childish, whimsical look, but personally — and this is my own entirely subjective opinion — I think it&apos;s a tremendous improvement from the original. Oh, and by the way, according to the user, this design was created not in Adobe Photoshop or Illustrator, but in Microsoft Paint. The use of conflicting gradients is the main source of visual disarray in iOS 7, but it isn&apos;t the only one. Apple also built a mind-bending parallax effect into the homescreen that gives the illusion of three-dimensional depth. But while some have hailed it as the "most awesomest feature" of iOS 7, from a design standpoint, Apple&apos;s use of parallax is a major headache. Why bother to smoosh all your app icons onto a 2D plane (and demand that other iOS 7 app developers do the same), only go to such great lengths to make the background look 3D? The parallax effect even violates Apple&apos;s own guidelines, which encourage designers to "embrace simplicity" and avoid including any unnecessary gimmicks. "Conspicuous ornamentation has been stripped away," trumpets Apple&apos;s iOS 7 website. But if a battery-consuming, processor-hogging imitation IMAX effect doesn&apos;t make it on Apple&apos;s list of "design elements that don&apos;t add value," I don&apos;t know what should. Obviously, I&apos;ve spent a lot of time in this article talking (some would say nitpicking) about design details that have little to do with the functionality of iOS 7. Inside the applications, Apple&apos;s new user interface designs are largely clean and logical improvements over their iOS 6 counterparts. And there are several new features in the new OS itself that are worth getting excited over, even if you&apos;re not an Apple fanboy like me. However, as countless reviewers have pointed out, the bulk of iOS 7&apos;s changes are cosmetic. Starting September 18, hundreds of millions of iPhone and iPad users worldwide will reboot their Apple devices to find several dozen new icon designs sitting on their home screens. Many will note their screen&apos;s resemblance to Candy Crush Saga in passing and never give the changes a second thought. Yet for the millions of people around the globe who depend on their trusty iPhones and spend an embarrassingly significant portion of their lives in Apple-land, these designs will become a small but ever-present part of their daily routines. Everyone from Senator John McCain to Kim Kardashian will touch iOS 7&apos;s unattractive Safari icon and interact with its mediocre (and still not-dynamic) Weather icon. Some may wonder why I&apos;m giving so much scrutiny to simple pixels on a screen. After all, to judge the aesthetic merits of, say, the mail icon on an Android phone or Blackberry would be a laughable waste of time. But this is different; this is Apple. This is the company that, since the creation of the original iMac, has awed us with its meticulously-crafted design and delightful user experience. "I want it to be as beautiful as possible, even if it’s inside the box," Steve Jobs once remarked. "A great carpenter isn’t going to use lousy wood for the back of a cabinet, even though nobody’s going to see it." But it isn&apos;t the back of the cabinet that the people at Apple should be worried about now — it&apos;s the front door. Gabe Grand is a hopeless techie and an amateur graphic designer whose skill doesn&apos;t come close to matching his perfectionism. For more impressions about Apple and iOS 7, follow him on Twitter.